The 2006 Food City 500 was an event held at Bristol Motor Speedway on March 26, 2006 as the fifth race in the 2006 NASCAR Nextel Cup Series season. Qualifying was cancelled on March 24 due to snow, sleet and rain, and the field was set with top 35 owners points from 2005, the Champion's Provisional (for Terry Labonte) and seven others, based on qualifying attempts in 2006. As a result, 2005 champion Tony Stewart sat on the pole. The race featured 18 cautions, and over 100 of the 500 laps were run under the yellow flag. Points leader Jimmie Johnson made contact with the car of Reed Sorenson, which caused a flat tire and put the #48 car several laps down; this would lead to him finishing 30th. Lap 188 saw the most notable wreck of the first half of the race, where Clint Bowyer spun Dave Blaney, causing a chain reaction collecting David Stremme, Brian Vickers, and Michael Waltrip. This brought out a red flag to cleanup. Jeff Gordon spun Martin Truex, Jr. out on lap 415, collecting Jeff Burton, Robby Gordon, and J. J. Yeley. Kurt Busch, who had made up two laps lost earlier in the day due to tire problems, used the "bump-and-run" to nudge Matt Kenseth out of the lead with four laps to go. Gordon used the same tactic to take third but on the final lap, Kenseth used the bump and run to spin Gordon out as Busch raced to victory. Gordon finished 21st and was involved in a shoving match with Kenseth on pit road after the race, for which he was put on probation and fined $10,000 by NASCAR. 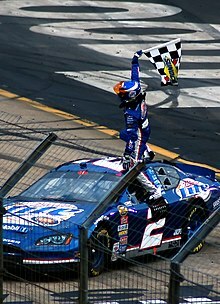 Kurt Busch celebrates after winning the 2006 Food City 500. Besides the dyed between Gordon and Kenseth, there also was bitter rivalry shown between Busch and Kevin Harvick following contact last week at Atlanta. During the pre-race ceremonies and in the drivers meeting, Harvick spent his time taunting Busch for no good reason. Busch ignored his insults and dismissed reporters. Harvick had been complaining about Busch all week and once retorted that Roger Penske (Busch's team owner) would make a fool of himself in hiring Busch. NASCAR warned Busch and Harvick that if they got into a feud on the track, they would get penalized. Busch later won the race and Harvick ended up second. When interviewed, Kevin was not finished and said "I am glad for my second-place spot but seeing Kurt [Busch] up there is terrible. I hate to see him win. He is a big whiner." The win was Busch's fifth in 11 career races at the track and the fifteenth in his career. It was Dodge's first win at Bristol since Richard Petty in 1975. Wikimedia Commons has media related to 2006 Food City 500.